Whether you’re planning a family vacation, or have a business meeting abroad, we’re sure you’ve been a bit anxious about checking-in on time. Maybe you’ve even had one of those bad dreams where you’re sprinting through the airport with your suitcase in hand just to find out that you’ve missed your flight. Let’s not make that a reality. 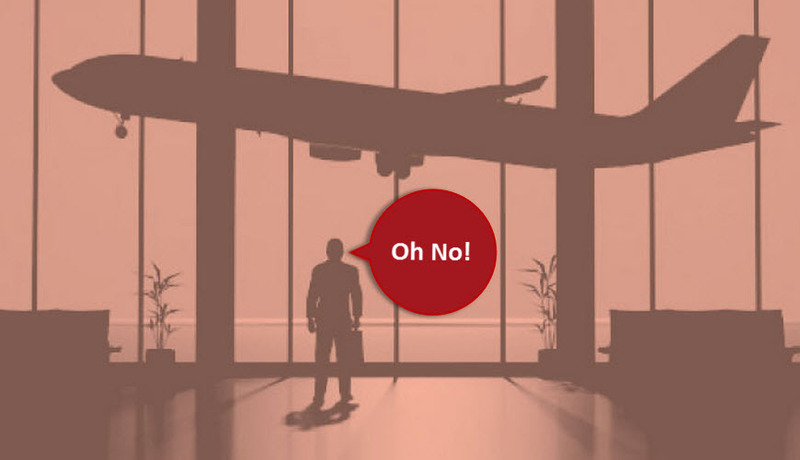 Below are 5 tips to make sure you don’t miss your flight! Use these times as a general rule of thumb, but always check with your airline for their check-in deadlines too. When you are preparing for your travels, take advantage of the online check-in process that most airlines have available 24 hours before your flight’s departure time. It allows you to complete your seat selection, indicate the number of bags you intend to check-in as well as print off your boarding pass in advance of arriving at the airport. This will save you some time by not having to stand in line to use the airline’s kiosks at the check-in area at the airport. Airlines have deadlines for check-in times, baggage drop-off as well as a deadline to be present at the boarding gate. The times vary depending on whether you are travelling domestic, trans-border or international. These deadlines may appear to be unreasonable; however, they are in place to ensure travelers have allowed themselves sufficient time to board their flight, factoring in any unexpected or unforeseen delays that can interfere with getting to the boarding gate on time. Many travelers falsely assume that they can arrive at the airport by the airline’s check-in deadline and still have plenty of time to go through the check-in process. This is not the case. The airline’s check-in deadline means you should have already arrived at the airport and have checked-in by the deadline to ensure that you reach the boarding gate on time. You can always assume that the check-in, custom and security lines will be particularly slow during the airport’s high traffic travel periods, which are early morning, noon and early evening as these are the most desired times to travel, especially for business travelers. Then, there are the busiest travel days of the year, which include holiday times such as March Break, Thanksgiving, Christmas, New Years, and most Fridays and long weekends in the summer, which can cause a bottleneck effect. 5. Remember You’re Not The Only One Flying! When travelling on an international flight, travelers should always factor in the fact that they will have to go through the check-in, customs and the security process with hundreds of other travelers. Consider that there is more than one airline operating more than one flight to various destinations and all those travelers are also arriving at the airport with the same goal to check-in, get through customs and security checks to make their flights on time.